Hello! My name is Jeremy Frank, and I’ve had this website since about 2001-ish. Until late 2008, it was mainly a place for me to store random technical notes and links, upload photos, and run odd URL rewriting experiments. However, I was sufficiently impressed with WordPress 2.7 that I decided to try out this whole blogging thing and see how it goes. What could possibly go wrong? For those of you wondering about the name luckydragon.net: I was doing a lot of adjective-noun (blueshoe, quickfish, megarobot) domain hunting on various registrars , and luckydragon fell out of my head. I will admit to being partially inspired by William Gibson’s book All Tomorrow’s Parties, but I should also point out that I once won $200 on a scratch-off lottery ticket, and, according to the Chinese zodiac, I am a dragon. So, yeah. 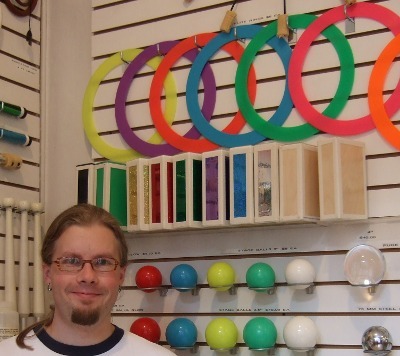 This is me, in the Dube juggling store in New York City. Check out all those fun toys!